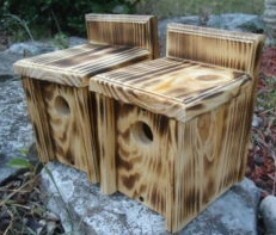 We offer fire hardened yellow pine bird houses and natural unfinished yellow pine bird houses. Great for wren, chickadee, titmouse, nuthatch, and other small birds. Outside dimensions 8" x 5 1/2" x 6 1/4" with a 1 1/4" entrance. Front is removable for cleaning by removing two screws. Two pre-drilled holes for mounting. We also offer these individually and in natural unfinished style. Just check our other items to find them. Paypal preferred. Please pay in a reasonable amount of time. We will usually have items packaged and awaiting pick up by USPS within 24 hours of receiving payment. 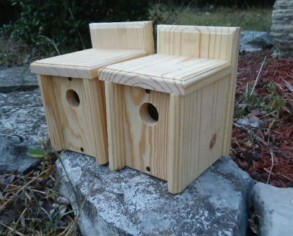 All bird houses sent Parcel Post to save on shipping cost. Please allow 6 to 10 days for delivery. If you would prefer Priority shipping just select it when you order and include a note saying that you did. If for any reason you encounter a problem (which very rarely happens) with your order let us know and we will make it right. Our feedback speaks for itself. If you have any questions just ask before you bid.